I've decided to try something new with the upcoming release and do some write up of some of the upcoming features and how they can tie in to each other or enhance functionality we already have or maybe have you discover you didn't know you could do already or inspire you with a feature idea or suggestion. R12 is currently far from done (I estimate about a month left to go) but it's good enough to likely start a first beta / preview look next weekend so here's me trying to get you all hyped up so you'll be eager to test when the time comes and play with the new shiny things on your favourite viewer (and of course show up friends on other viewers who aren't really innovating or creating original features anymore 😛). 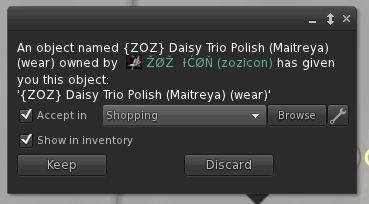 The base idea is simple, whenever you buy or grab something you have to click that “Buy”/’Pay”/”Keep” button anyway so wouldn’t it be great if we could just do some pre-sorting right then and there?! It wouldn’t really interrupt the flow of going to an event and hovering up demos or buying things you’re sure you want since you don’t actually have to go to your inventory while you’re at the event and you’d be able to teleport home with an inventory no worse off then when you arrived. 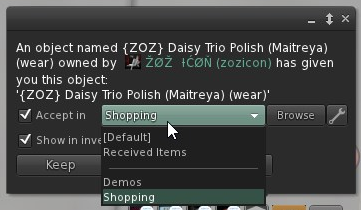 Demos / Shopping – this is where things get really interesting since these 2 options aren’t there by default but are rather things I configured to suit my own OCD inventory sorting needs. 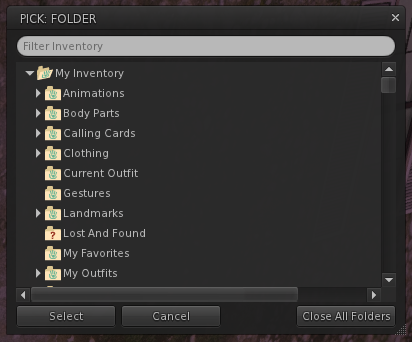 You can filter your folders from the textbox and there’s a convenience button to “Close All Folders” should you need but this floater should be fairly self-explanatory. The little wrench icon is there to allow you to do far more advanced / in-depth configuring to tweak everything to how you personally manage your inventory. 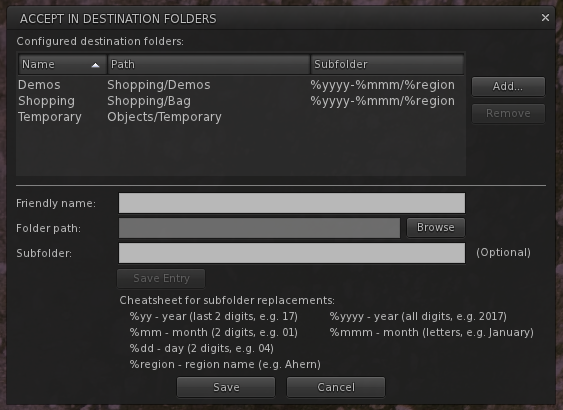 Before I made this feature, I did actually have a safety net for the vast number of unsorted items flooding my inventory: a “Shopping Bag” folder, further divided into year and month of when I bought/acquired the item. But wait; there’s more still! What’s the subfolder column about?! Dumping everything into a “Demos” and “Shopping” folder already feels like a big improvement over what we currently have but still I’d prefer if all items auto-routed to a folder named after the month I got them and just because I want to go hover up demos from several events in a row I’d really like to be able to identify which event I got the demo from I’d like to further split them up into region name as well. So this is where the “Subfolder” textbox comes into play: it allows you to specify dynamic subfolders (which I know sounds really complicated to anyone but me, sorry ☹). Note that this is only the very first iteration of the feature, and that I’ve not even done any shopping with it beyond what I needed to write this initial post up so expect things to still change and improve. If you have any questions or comments, then please, do poke me. Finally, I hope that this feature was a good one to kick start the new release and upcoming campaign and inspire you to at least consider supporting this TPV dev kitty. This feature (and many others) will be coming to a Catznip viewer near you very soon (likely next weekend).